Ideally located, pretty T2 of about 50 m ², on the first floor of a residence with elevator, close to the beach and the trade of Arcachon. His living room with a double exposure, very bright, overlooking a small balcony, which offers a break on the Basin, you have a couch bed for 1 or 2 beds (1 x 80 or 2 x 80 is a 160 ), TV, WIFI, its dining area and a large closet. A separate fully equipped kitchen with hob, oven, hood, fridge / freezer, dishwasher and microwave, Senséo. A room with a bed 160 for two people and its large closet. A bathroom with washing machine. A separate toilet with washbasin. And a large pantry. The parking is not located in the residence but you have a badge access to Indigo parking downtown (under the market square Arcachon). ADDITIONAL SERVICES: -Draws: 20 € / person and week, bath kit: 15 € / person and week, baby chair / cot: 10 € / week. A stone's throw from the Dune du Pyla, at the gates of the wide beaches Océanes landaises, you can choose, enjoy the 220 kms of bike paths, discover the Basin by boat, practice or introduce you to surfing, fly over the Dune paragliding, multiply the golf courses, all by tasting the wines and oysters of the region. It's up to you to build your program, according to your desires and your days. There is no doubt that the richness of the region, its natural environment and the diversity of possible activities will contribute to the success of your next vacation. 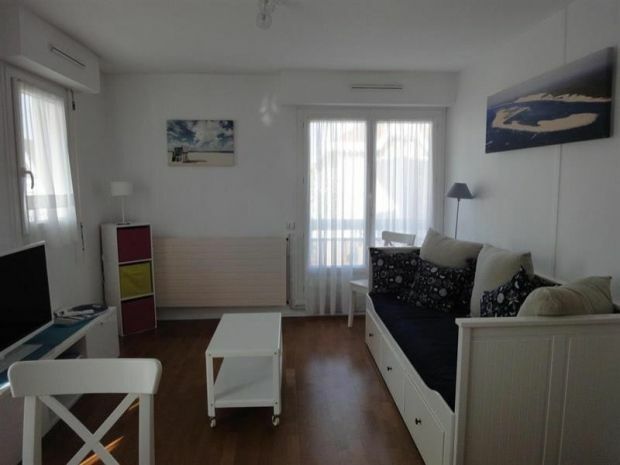 Appartement fonctionnel, lumineux, très agréable et idéalement situé. L’agence qui gère la location est très professionnelle et sympathique. Ils ont un vrai sens du service et de l’accueil. Cela contribue à la bonne impression générale. Merci à eux! Appartement très agréable pour 2 personnes. Très fonctionnel. Beaucoup d'équipement et rangements. Très clair et près de tout : marché, commerces, plage. Manque fauteuils dans le salon car divan très peu confortable et trop haut pour un accès facile. Manque attache dans la salle de bain pour accrocher la douchette (difficile pour se laver les cheveux).